Research indicates that workplace design has an impact on your mental health and wellbeing. It also has an impact on the earth. We built a workspace that positively impacted both. After the initial move in day, we began to do what all companies do. We bought furniture, desks, chairs and a lot more. The office was nice, but didn’t really represent our uniqueness. About two years after our move, we decided to transform our space into something that is true to who we are, and did so in a manner that aligns with what we value. 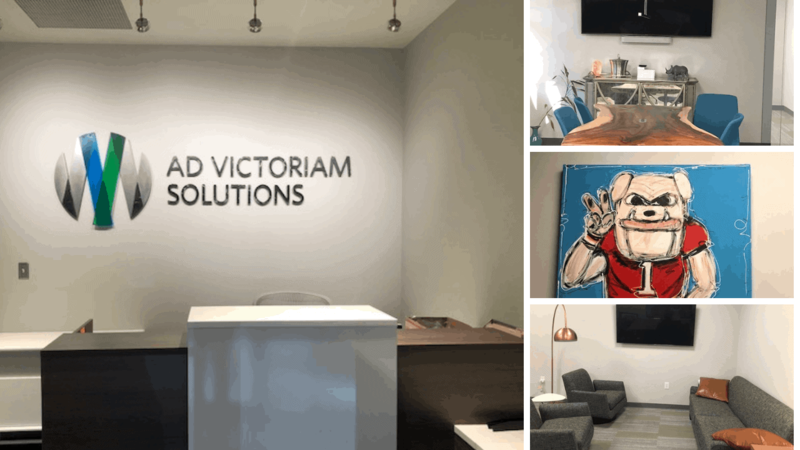 Blu Interiors, a full-service, female-owned, interior design group founded with a mission to provide well-conceived, functional design plans was hired to improve the Ad Victoriam headquarters. With Blu Interiors, we not only created a productive, open, and inspiring place to work, we were also able to reduce our environmental impact. The design firm and furniture brokers were women-owned businesses. The construction company and drapery designer were both local. Our new Ad Victoriam Solutions sign in the lobby was manufactured in Atlanta, Georgia. The Bulldog artwork displayed in our office was commissioned by an artist in Athens, Georgia. Filzfelt, 100% biodegradable and renewable sheeps wool, was used to soundproof our meeting rooms. Our new whiteboards are made from Clarus glass. They are manufactured with Declare, Environmental Product Declaration, and Indoor Air Quality Certifications. Our bathroom counters are ISO 14001 Certified, the carpeting is Cradle to Cradle Certified and the furniture is GreenGuard Gold Certified, making all of these items environmentally friendly. Replaced all light bulbs with LED bulbs and added motion sensors so lights turn on when someone enters the space and turn off after 10 minutes without motion. Added motion detected one-sheet paper towel dispensers to decrease waste. Installed low-flow toilets and motion activated sinks to reduce our water waste. Finally, a local moving company was hired to help us donate our used office furniture to two non-profit organizations, Lifeline Animal Shelter and Habitat for Humanity. We’re not changing the world, but we are making an impact. It’s a small B Corp ripple, but a ripple worth making. And, if we can inspire other companies and individuals to consider environmental impact in their purchasing decisions, the scales will start tilting in the right direction. Ad Victoriam is a Salesforce Platinum Partner and a MuleSoft partner who provides mission-critical consulting services, from strategy to implementation. Our nimble team of certified professionals across the country who accelerate businesses by solving complex problems through cloud and data expertise. As a certified B Corp, we put purpose over profits, and have made a strong commitment to community.